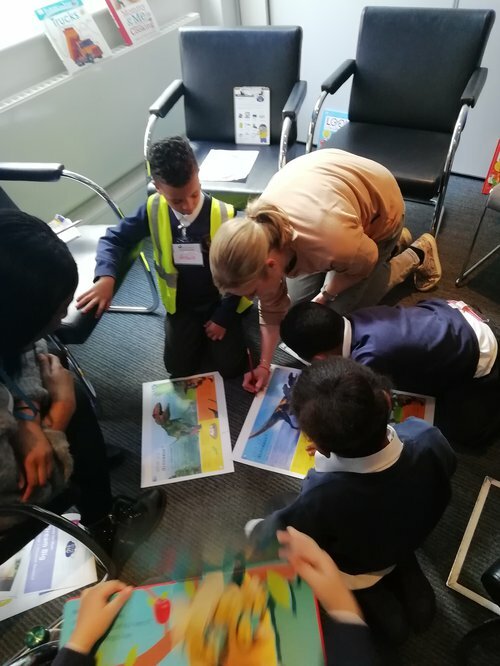 Words for Work: Dream Big gives Year 1 pupils the opportunity to visit a workplace, explore different jobs through play during a Dream Big day at school, and then celebrate their progress with their parents at the end of the programme. Vauxhall Primary School’s Year 1 class became publishers for the morning on their workplace visit to DK publishers. Supported by volunteers from DK, first pupils were set on a mission to find out what the grown-ups do all day at their computers. Pupils saw books being printed, designers creating new book covers and number crunching in the finance department. “It was good for the children to see the magic behind books,” commented one teacher. “It gave them an understanding of how they are made and how the pictures are created”. Next, the pupils became editors, choosing spreads for books. They were given a choice of three book covers for a new dinosaur book. Working with the volunteers to choose which dinosaurs should feature on the books, they used their literacy skills to explain their choices and reasons for each selection. It was then time for the pupils to find out what the volunteers really do in their day-to-day jobs. Pupils picked everyday office items like post-it notes and business cards from the ‘business bags’ and discussed how volunteers used these in their roles. Pupils were encouraged to ask questions and think about if they use these items at school or home. The morning at DK was a tremendous success with pupils, teachers and volunteers learning a lot from each other, and looking forward to the Dream Big day at school where they would get the chance to explore careers through play. Vauxhall Primary School’s head teacher thought the day at DK’s offices was ‘excellent’ and noted that “DK provided a great first time experience for our Year 1 children”. On the Dream Big day at the school, teachers created six 'workplaces' in the classroom and the pupils spent the day immersing themselves in the different careers. Each 'workplace' included a book relating to the career, dress up and props to help them imagine themselves in the role as well as literacy-based activities like prescription pads to fill out, shopping lists to write, and recipe templates to complete, as well as items like eye chart tests to encourage reading. Commenting on the free resources provided, the teacher said that they “were great [and] captivated the children’s attention immediately”. Through giving the pupils time to play and explore each career, they could experience the practical application of literacy and really imagine themselves in the different jobs. At the Dream Big celebration, parents were invited to hear about the programme and pupils explained what they had been doing and received certificates. The Vauxhall Primary School head teacher explained that the Dream Big programme “gave the children who are usually shy or quiet a chance to speak about and experience new and different things”. Find out more about Words for Work: Dream Big. Vauxhall Primary School pupils became publishers for the morning on their Words for Work: Dream Big workplace visit to DK publishers.